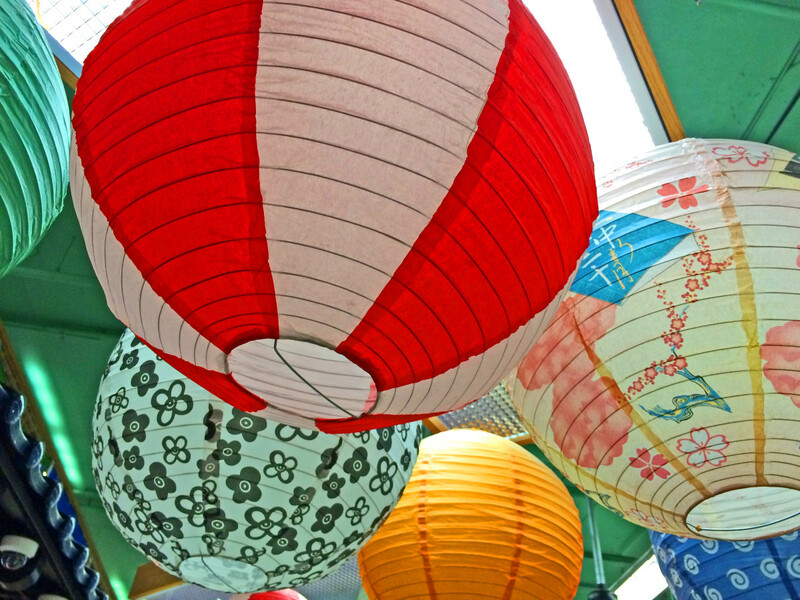 Lanterns are a big part of Chinese New Year, also known as Lunar New Year or Spring Festival. On the last day of celebrations (the holiday typically lasts about two weeks) people gather in the evening to light the lanterns, eat dumplings and watch lion dances. 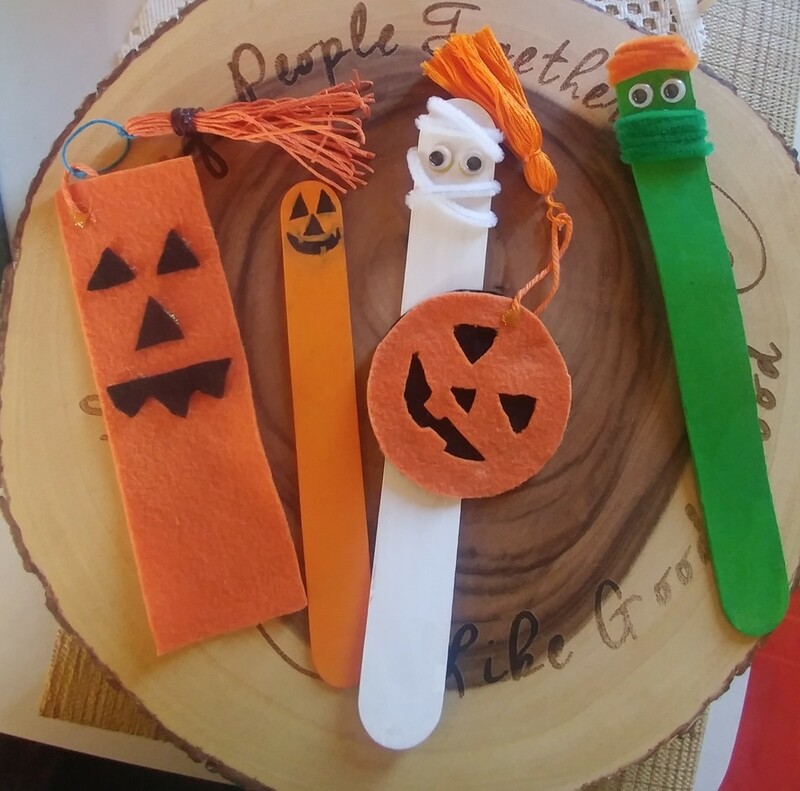 See below for instructions on how to make easy and fast paper lanterns and some quick ways to change the technique and add embellishments to make your lanterns unique. My daughter and I worked together one afternoon to make these festive Chinese lanterns. We hope you enjoy our lanterns and our photos. 1. 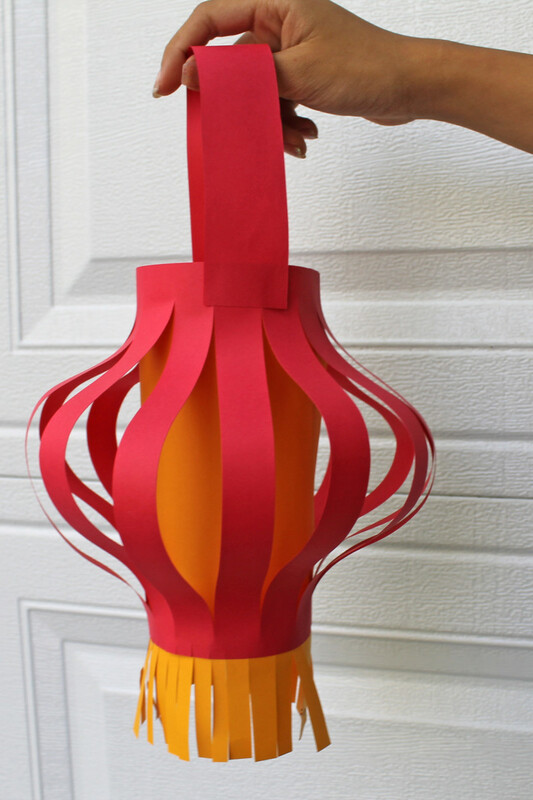 The simplest way to make a Chinese lantern is to get a rectangle or square of colored paper and fold it in half. I like to fold it along the long side to make my lantern bigger around, but you can make a tall and narrow lantern if you fold it the other way. 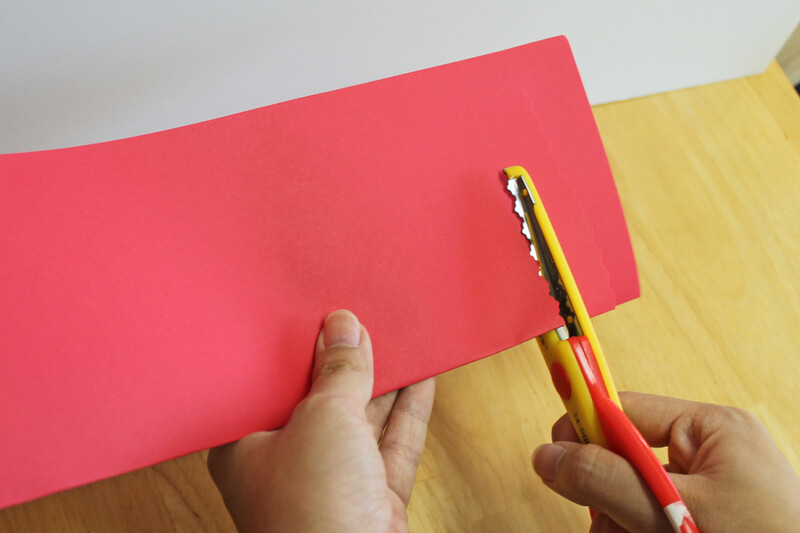 Cut your Chinese lantern from the fold to about one-half inch from the edge of the paper. 2. 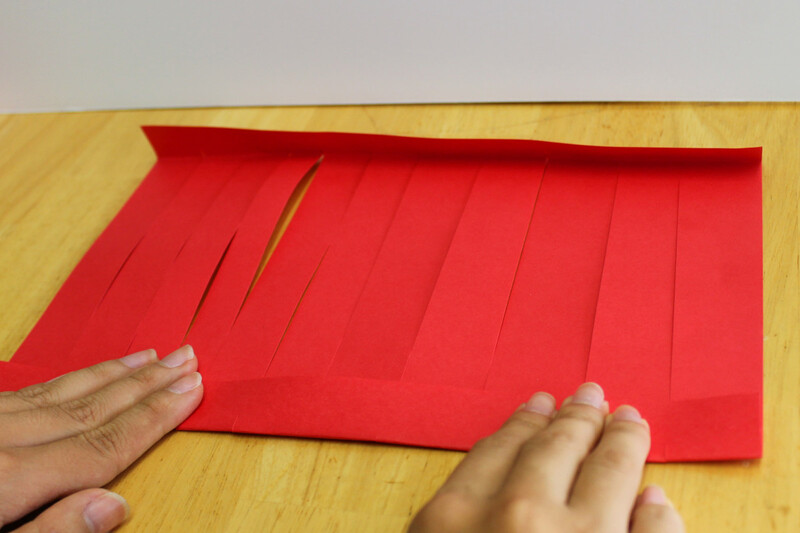 Starting from the folded edge, cut strips in the paper, but MAKE SURE YOU ONLY CUT TO WITHIN ½ INCH OF THE EDGE OF THE PAPER. This way, your paper will still be attached on the top and bottom. 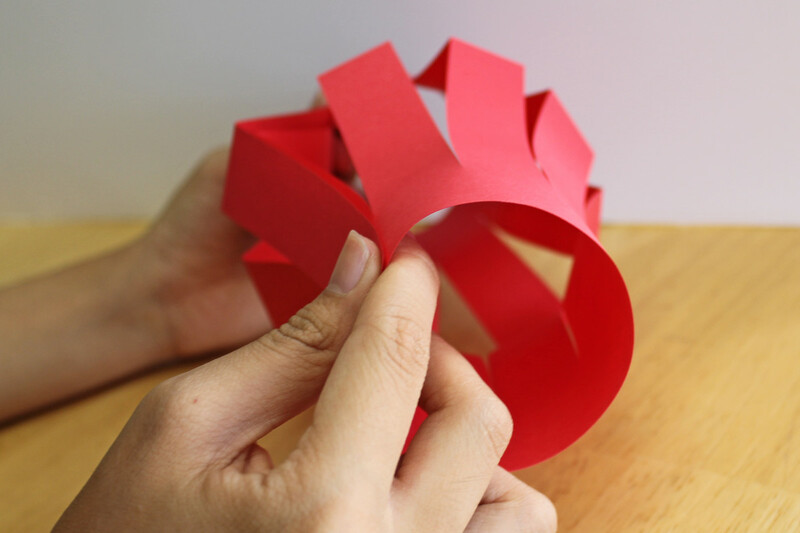 Once you have cut the paper for your Chinese lantern, open it up and bring the ends together to make a circle. 3. Open up the paper and fasten the short edges together. 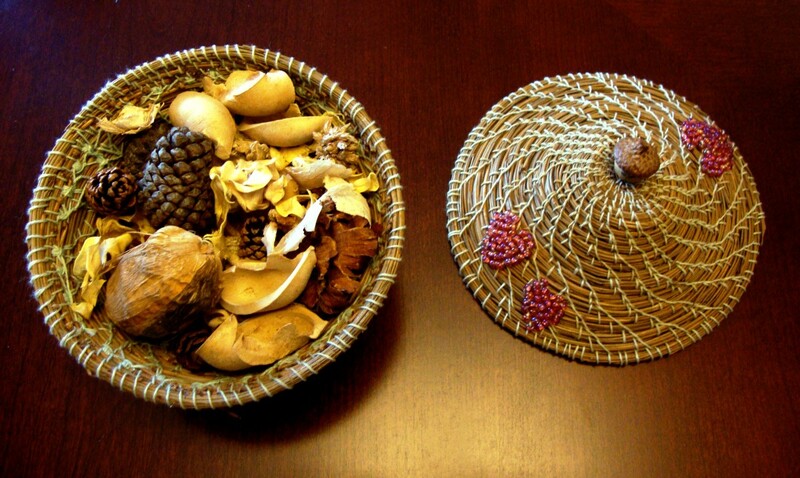 You will have made a circle with the top and bottom, and the middle will fold out into a lantern shape. You can glue or staple the edges, but I like to use double-sided tape for the lantern projects. It’s fast, not as messy as glue, and doesn’t leave a staple showing on your projects. 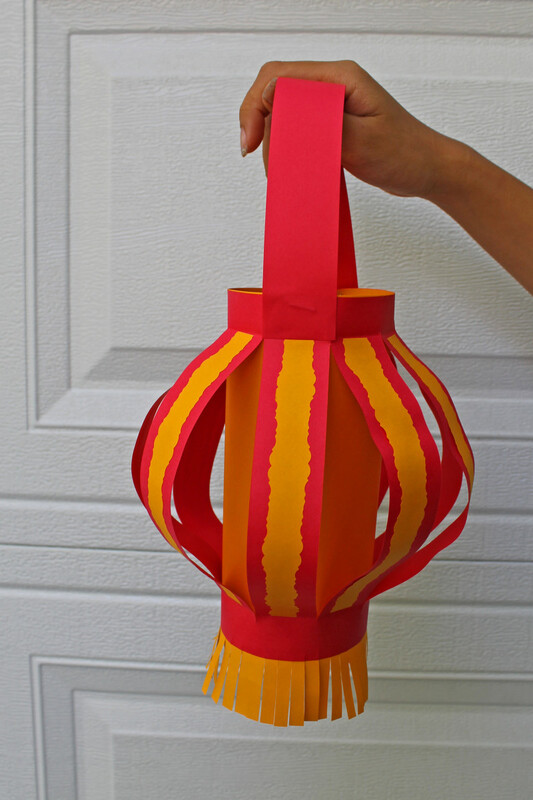 Here is a simple Chinese paper lantern with some of the tools use to make it. 4. Cut a strip of paper to make the handle. Again, I like using double-sided tape to fasten on the handle. Here is our first simple lantern. 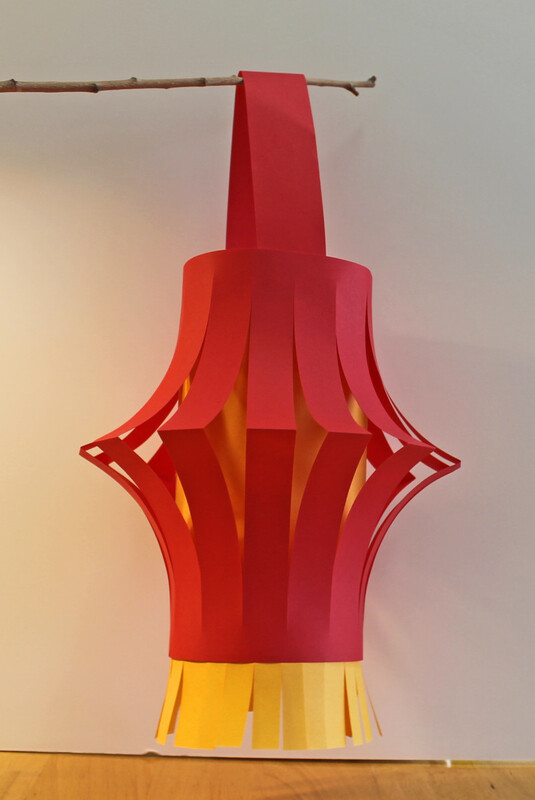 Red is a traditional color for Chinese lanterns, and especially for New Year's lanterns. It represents happiness, beauty, success and good fortune. I'm not sure why I did so many craft projects with glue. The glue sticks don't hold super-well and they can get a little messy. If you just need to tack something in place, double-sided tape is much faster, and you don't have to let the glue dry. And if I make a mistake in placing something, I've found that I can usually peel the paper off carefully and re-position it. 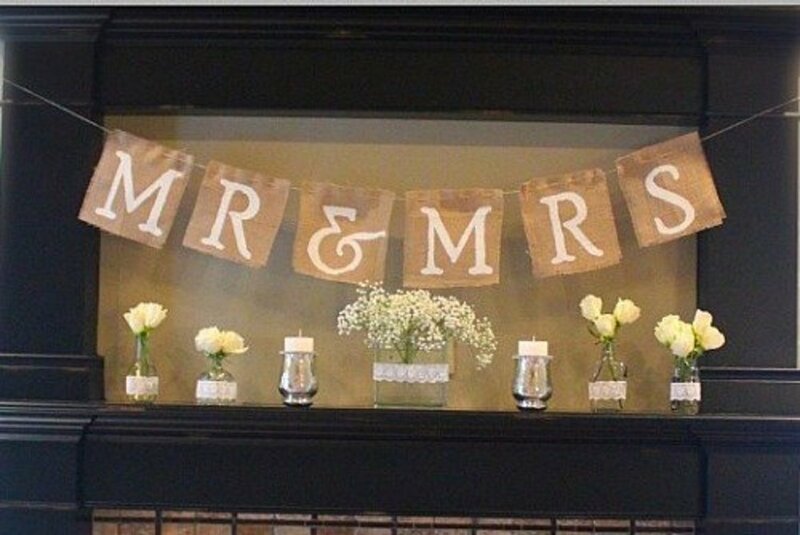 The only exception to using this tape is if you are using construction paper or card stock to make your lanterns. Staples work better to fasten the lanterns made from heavy paper. Make them in different colors. Red and gold are the most traditional colors used to make the lanterns, but lanterns come in all colors, as you can see from this photo of lanterns in a Chinese market. 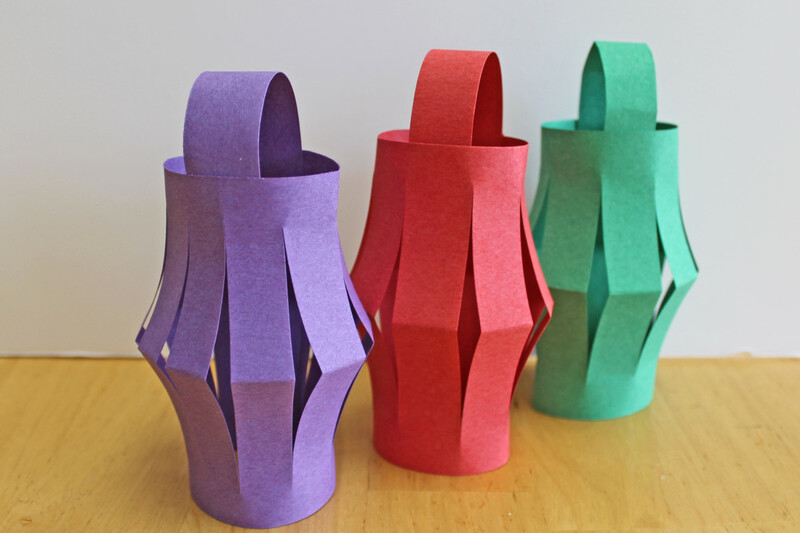 Use different colors of paper to make your lanterns. 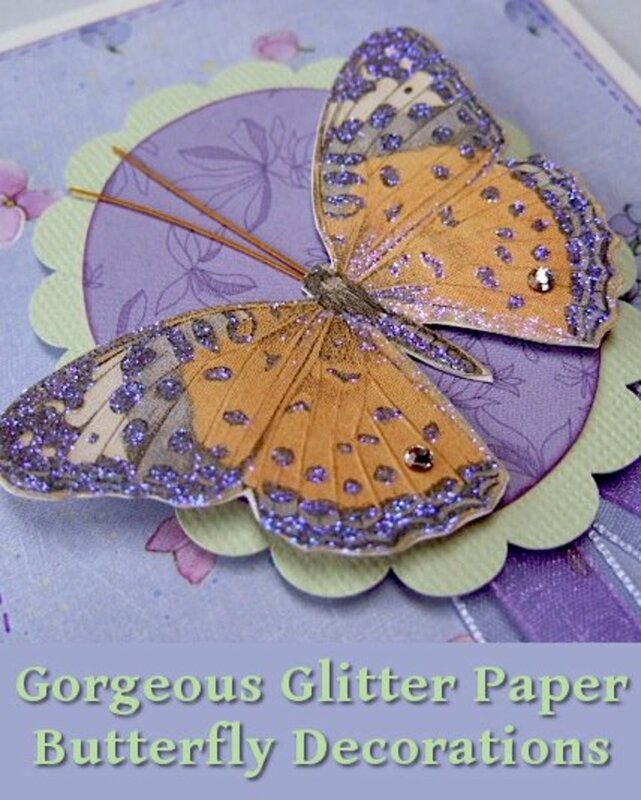 You can also use the patterned papers that you see in craft and scrapbooking stores. 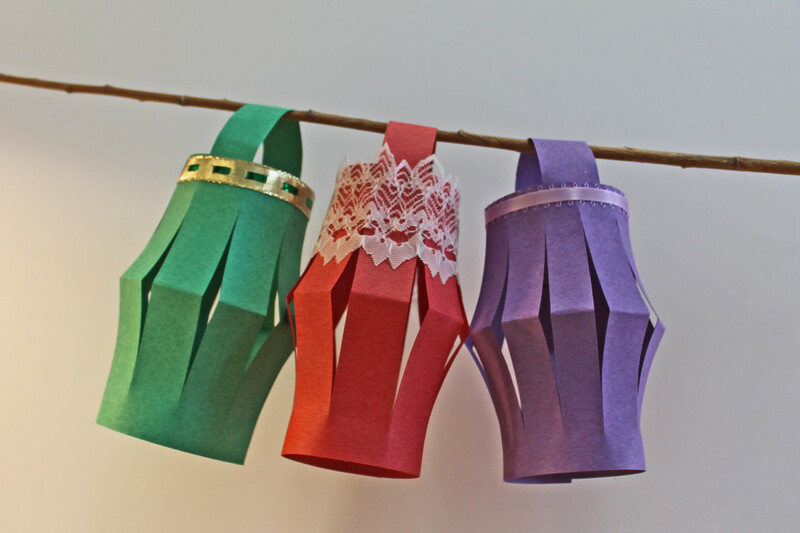 You can use brightly colored construction paper to give your Chinese lanterns some flair. You can find a wide variety of patterned papers at your local craft or scrapbooking store. 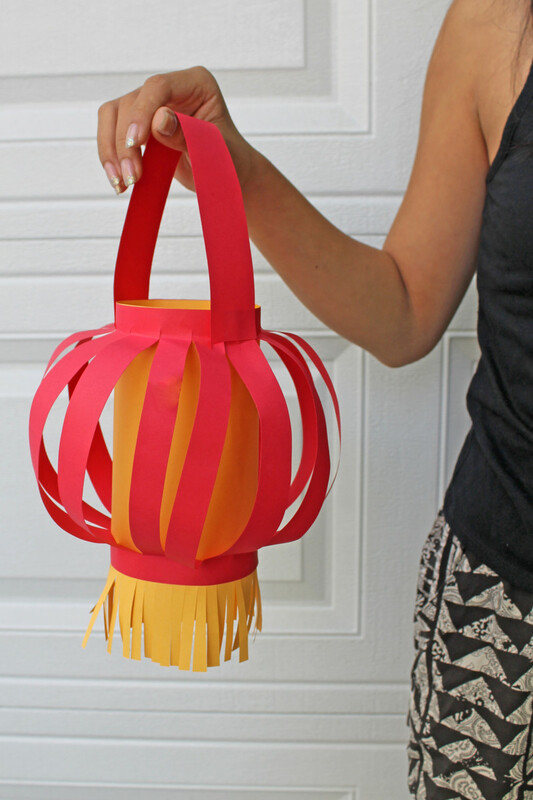 Add bits of ribbon or lace to your Chinese paper lanterns to make them unique. 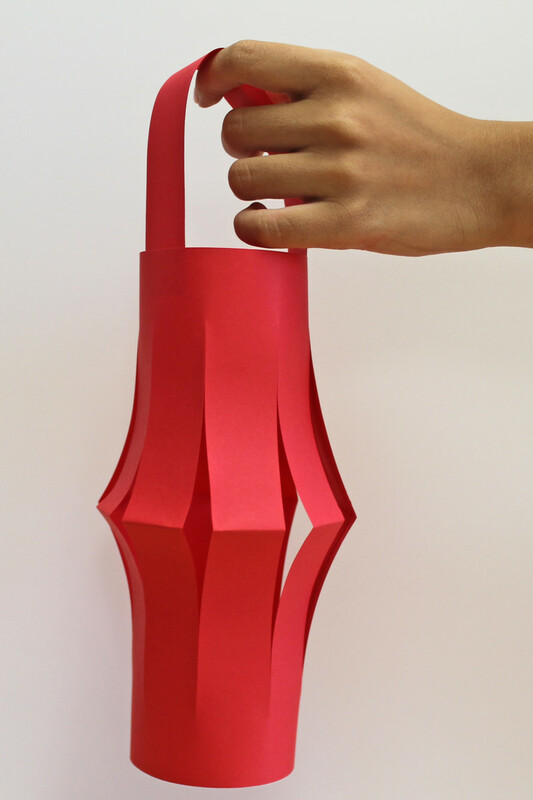 Use paper edger scissors when you cut the strips into your lantern. 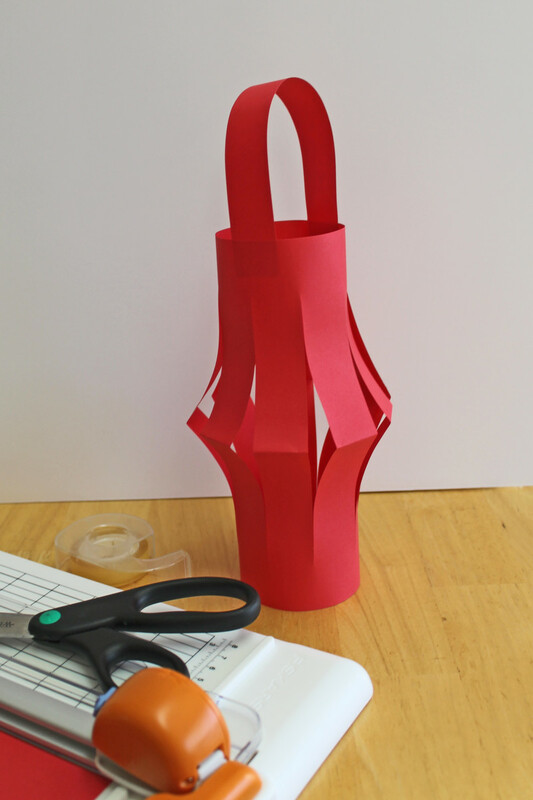 Using these decorative scissors is a fast and easy way to add character to your lanterns. I've had these Paper Shaper scissors for over 10 years. They've worked well and have been an easy way to add decorative borders or unique touches, as they do for this version of the Chinese paper lantern. This set has 12 different edging types, which should give you lots of options with your craft items. One tip I have is to cut carefully and line up the pattern on the scissors with the part you've just cut. That way, the pattern will stay the same the whole way through. Do the same kind of cuts you did for the simple Chinese lantern, but use the special edging scissors instead. 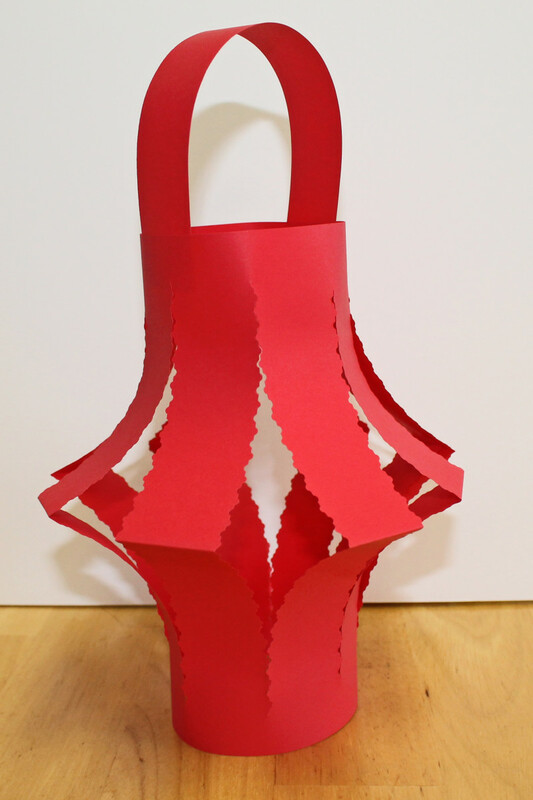 Here is a variation on the simple Chinese paper lantern. Use decorative edging scissors to cut the lantern strips. Here, you can see the gold tube of paper inside the Chinese paper lantern. Put a liner inside your lantern. For this lantern, I formed the gold paper into a tube, and then taped the red lantern over the top of it. It looks a little like there is a light glowing inside. Since you want the outside part to bow out a little, you’ll tape the bottom a little higher on the tube. You can cut off the bottom of the tube if you want your lantern to sit on a surface. Or, you can cut it into fringes, as I have here. 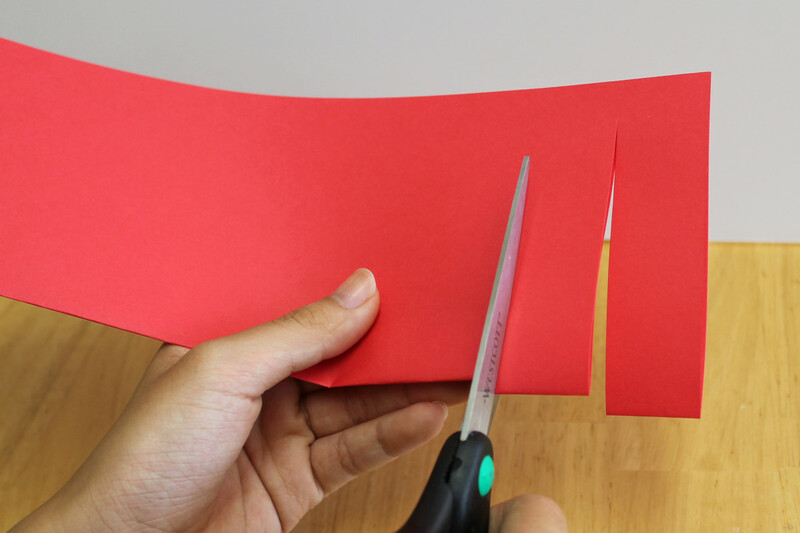 Use a paper trimmer like this to make cuts in the center of the paper. Change the shape of the lantern by changing how you fold it. 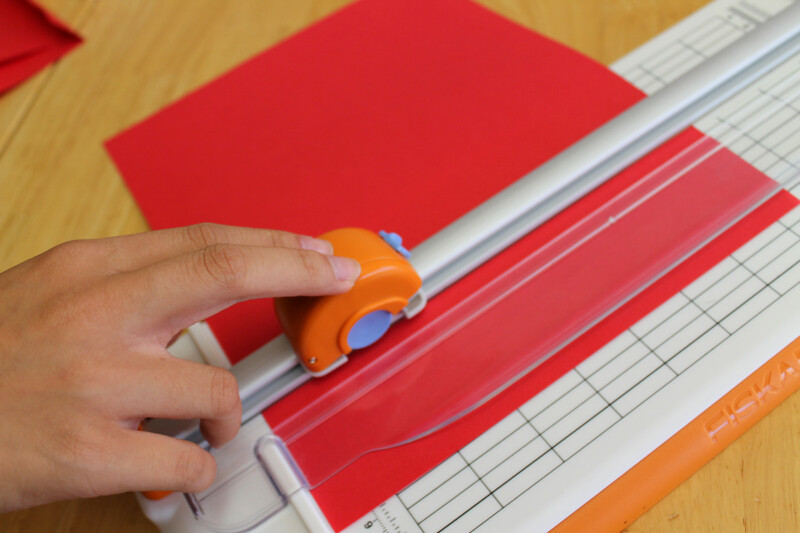 For this rounded shape, I used a paper trimmer like this. I was able to cut the strips into the paper without folding it in the middle. I've had two Fiskars paper trimmers, and they've both worked great. Just remember to press down firmly all the way to the end of your cut. If you let up a little at the end, you'll end up creasing the paper, but not cutting it. These kinds of trimmers have more versatility than the "guillotine style" with the long blade. You can make cuts that don't touch either edge, like I did for the round Chinese paper lantern. You can also make other kids of cuts within the paper--square edges, for example. These cutters have lots of guide lines to help you line up the paper and get the exact cut you want. Just remember that you will need to replace the blades from time to time when they get dull. Fold the top and bottom of the lantern towards you. When you fasten them to the tube in the middle, the center strips will bulge out in a round shape. Then, I folded the half inch at top and bottom of the paper. When I attached it to the middle tube, I was able to get the strips to bow out into the balloon shape for this lantern. The strips in this Chinese paper lantern have a round effect because the top and bottom were folded, which allowed the strips to balloon out. 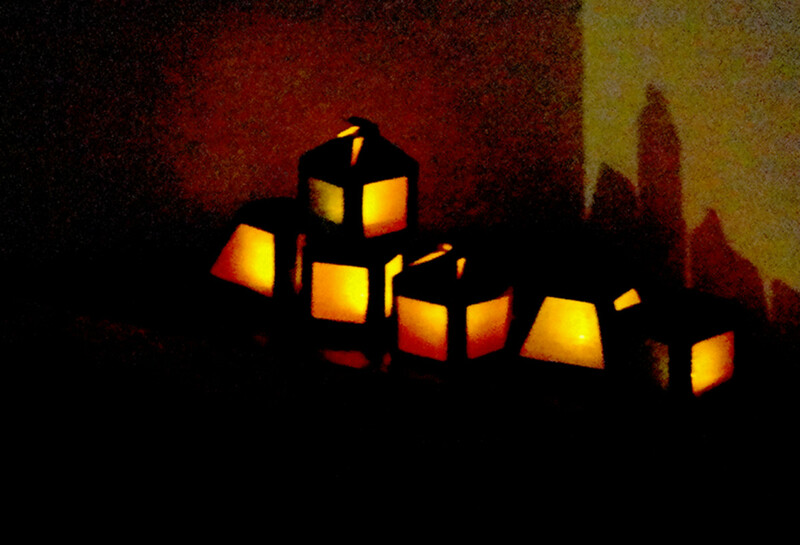 Alternately, you can get more of a “hurricane lamp” look to your lantern if you don’t fold the top and bottom edges. The curves on the lantern will not be as round. For this lantern, the top and bottom were not folded. The strips curve into a shape more like a hill than a half-circle. 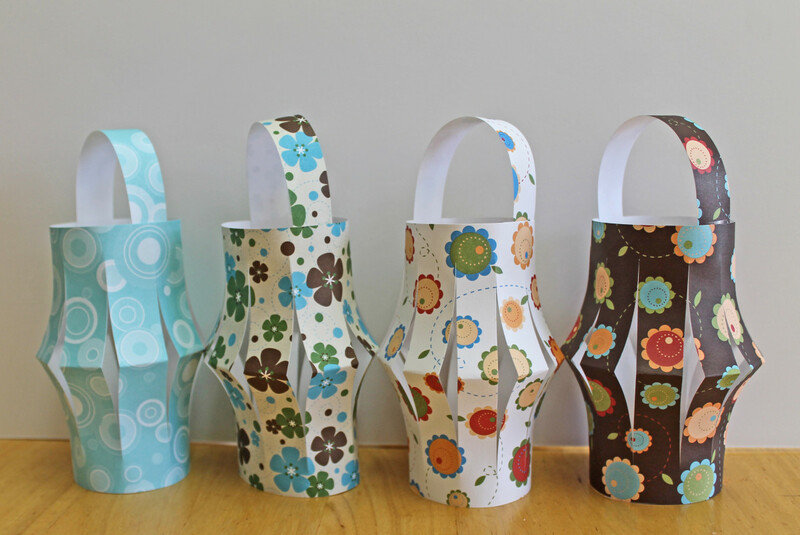 Add embellishments to the strips on your lantern. Here, I cut strips of gold using my edger scissors and I fastened them on before attaching them to the center tube. Here the rounded Chinese paper lantern with decoratively-edged paper adorning the lantern's strips. 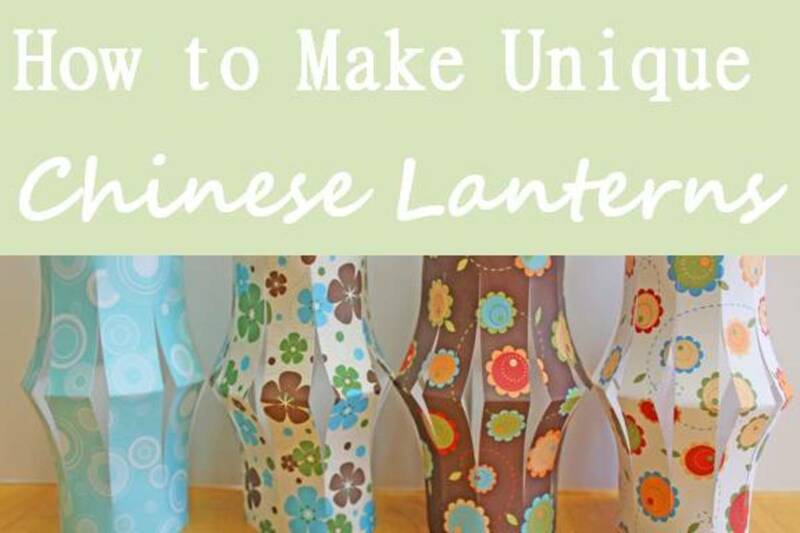 Here are a couple of video tutorials that show you how to make Chinese paper lanterns. The first demonstrates the simple lantern shown at the beginning of this site. The second has a rather more involved process for making a round lantern. The women cut the individual strips, then glue them on to the center tube. I believe things go faster with a special paper trimmer and some double-sided tape, but I do like the gold trim they used at the top and bottom.